Jericho native Sarah Hotchkiss trained as a violist from the age of 11, played in the Vermont Youth Orchestra and attended the Crane School of Music in Potsdam, N.Y., for her first two years of college. Though she loved playing Beethoven and Bach in string quartets, she felt “ambivalent” about the fit, recalls the now 54-year-old. So Hotchkiss took up fiddling, a musical tradition she calls “fun and accessible.” That’s partly because it’s passed on aurally — that is, by demonstrating a tune and having students join in until they’ve learned it, too. After years of teaching at her private Montpelier studio, Woodbury Strings, Hotchkiss decided to give her students and local fiddlers a chance to experience ensemble playing. In 2003, she founded the Vermont Fiddle Orchestra. The aim was to include players of all abilities and still sound good. Twenty fiddlers showed up for the first rehearsal at Christ Episcopal Church in Montpelier, indicating that Hotchkiss’ creation filled a need. 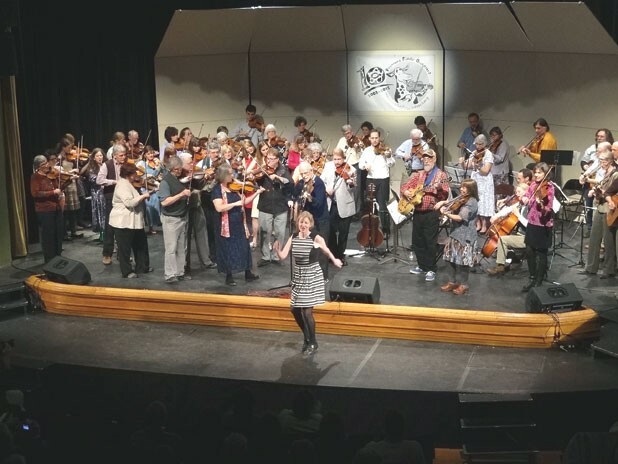 Ten years later, the VFO is sailing right along with 30 to 50 musicians, mostly fiddlers plus a rhythm section of cello, guitar, flute, bass, accordion and mandolin players. The group rehearses weekly and performs three concerts a year — including this Saturday’s holiday concert in Montpelier. The orchestra also plays gigs, such as First Night celebrations, from Woodstock to Burlington. Members are “teachers, farmers, businesspeople, people from all walks of life,” says the founder, and she misses them. Hotchkiss stepped down as the VFO’s organizing force after its 10th anniversary concert in April. She now lives in Winooski and is working on moving Woodbury Strings to Burlington with her husband and former VFO music arranger, John Mowad. Hotchkiss’ decadal achievement, however, won’t survive solely in aural tradition like so many fiddle tunes. Burlington up-and-coming filmmaker Elizabeth Rossano — Hotchkiss’ daughter — is currently polishing a documentary she began making three years ago about the fiddle orchestra and its founder. Rossano will premiere No Audition Required: The Vermont Fiddle Orchestra 2003-2013 in Montpelier and Burlington a week after the holiday concert. It was the VFO’s ethic of “access- ibility” that caught the 28-year-old’s imagination. Beginning fiddlers, Rossano notes, participate in performances alongside well-known soloists, even if all they can contribute is one note per bar. Eric Silvers, one of three members whose personal stories Rossano tells in the film, joined as one such newbie. The East Montpelier stay-at-home dad took up fiddling so he could play with his daughter, who was learning cello. Silvers’ daughter isn’t in the VFO, but the orchestra has a subgroup for children ages 5 to 14 called the Sap Run Fiddlers, who open every concert. “Thinking that if you’re not going to be a shining star, then there’s no point? There’s a lot of point,” the filmmaker emphasizes. Among other things, the orchestra provides a sense of achievement and a social support network. Rossano has an eye for deeply committed artists who are unconcerned with the “shining star” judgment — people such as Burlington potter Dan Siegel, the subject of a short she made and uploaded to YouTube. Just last month, Rossano and fellow filmmaker Ashley DeLucco won the 2013 Vermont International Film Festival’s James Goldstone Award, which honors emerging local directors. Their short, “Toby MacNutt: Body of Work,” features a dancer who is otherwise wheelchair-bound. Rossano majored in film and TV studies at the University of Vermont and cut her filming teeth making Bite Club videos for Seven Days. She is now channel coordinator at Vermont Community Access Media, one of Burlington’s three community-access television stations — a job that is itself about accessibility. Rossano credits free access to the station’s equipment with making her documentary possible, but she adds that anyone can use those tools, employee or not. "No Audition Required: The Vermont Fiddle Orchestra 2003-2013", directed by Elizabeth Rossano, premieres Saturday, December 14, at 10:30 a.m. at the Savoy Theater in Montpelier, with a screening the same day at 7 p.m. at VCAM, 208 Flynn Avenue in Burlington.